3rd part of Multi-Series Articles “Circular Interpolation Concepts & Programming”. 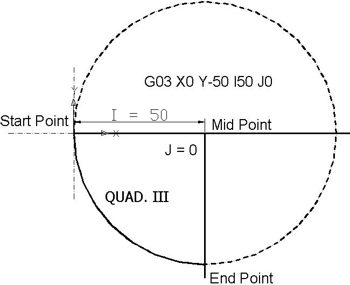 This part briefly explains how cnc machinists can Calculate and Program circular interpolation G02 G03 with the use of I J and K.
The I, J and K arguments specify the DISTANCE from the ARC START POINT to the CENTER POINT of the arc. 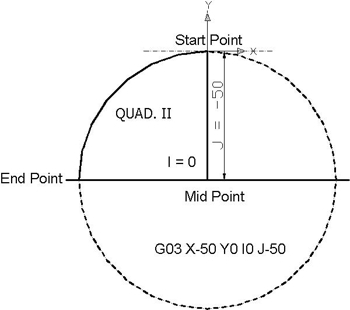 Note that the start point of the arc is NOT GIVEN in a G02 or G03 command. 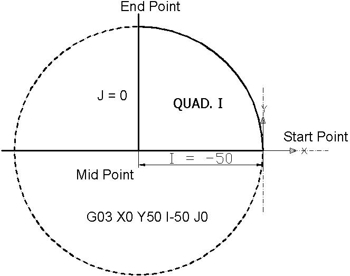 The start point is determined by the location of the cutter when the command is implemented. Also, the center point is never given explicitly in the command. I, J, and K are DISTANCES. If the geometry of the circle is impossible (to within .0001), an error is usually thrown. 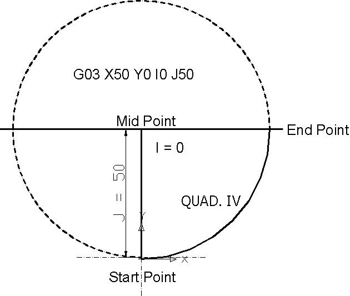 The following figure shows the four quadrants of circle and I, J calculation from start point to end point. Circle radius is 50 mm.